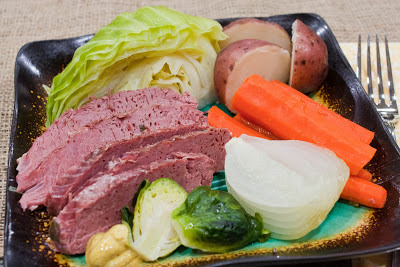 My main dish, Vegan Corned Beef and Cabbage, was such a huge hit that I plan to make it regularly from now on. I’m not usually a fan of processed fake meats–they’re only slightly more healthy in my opinion than their meaty counterparts–so I tend to use them sparingly. But once in a while a packaged product like Lightlife Steak-Style Smart Stripscan come in handy, and they turned out to be very good in this recipe. But then again, any meat substitute would taste great cooked with fresh vegetables and covered in a savory gravy. This is really comfort food of the highest order! This dish is not only delicious, but it’s remarkably low in fat and calories. Don’t wait for a special occasion to serve it! Sauté the onion in a large, non-stick pot until it starts to brown. Add the remaining vegetables, the broth, and the seasonings. Cover and cook over medium heat for 15 minutes. Add the “beef,” cover, and cook for 15 more minutes, until vegetables are soft. 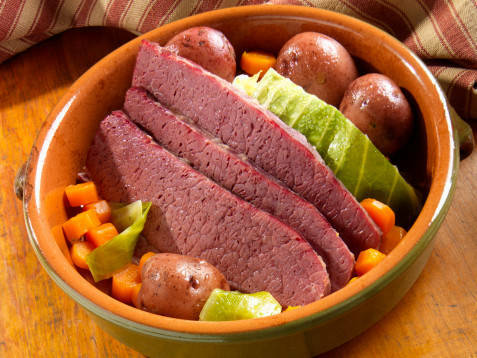 Use a slotted spoon to remove the vegetables and “beef” to a serving plate and keep warm. Return the broth to the heat. In a small cup, combine the flour, water, and wine. Gradually stir the flour mixture into the simmering broth. Cook and stir, scraping the bottom of the pan, until the broth has thickened, about 10 minutes. Pour the gravy over the “beef” and vegetables to serve. Makes 4 servings. Each serving, using the Lightlife strips, contains 117 Calories (kcal); trace Total Fat; (3% calories from fat); 10g Protein; 20g Carbohydrate; 0mg Cholesterol; 336mg Sodium; 7g Fiber. Preheat oven to 400 F. Cut small red potatoes in half, larger red potatoes into quarters (all should be about the same size). Allow about 1 1/2 to 2 pounds of potatoes for 4 servings. Place in a non-metal baking dish and spray lightly with canola oil (optional). Bake until potatoes are lightly browned and tender, about 45 minutes. Remove from the oven and sprinkle with salt and dill weed, to taste. I also wanted to show you the Irish Soda Bread I made and which Sancho decided to shape like a shamrock. I was all set to put it in the oven as a very rustic sort of circle, but the damn monkey jumped in and made it much cuter. It’s a very basic bread, not much to write about, but I include the recipe here in case you ever need a simple, vegan quick bread. 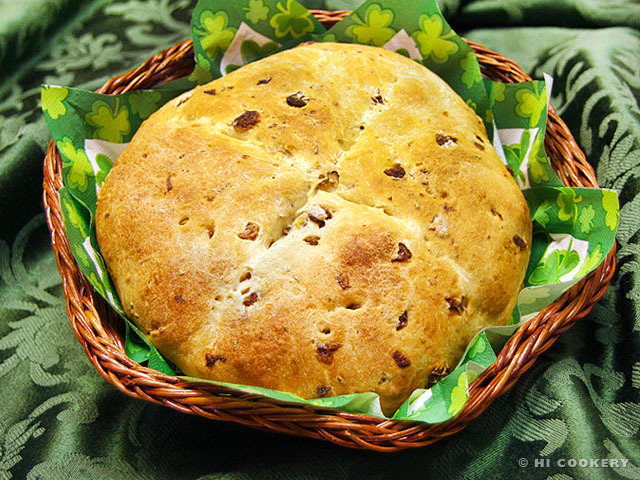 We made it the traditional way, without any enhancements, but you can add herbs or raisins or any other flavorings to make it fancier. Preheat oven to 400 F. Mix the dry ingredients together. Add the yogurt and use your hands to mix it in well. (Add more flour if the dough is sticky, more yogurt if it’s too dry.) Shape into a ball and put on cookie sheet. Bake until golden brown, about 25-30 minutes Stay Medium Gorgeous vegans, and don't forget to pick up an instrument and read lot's of books! Help your brain help your body and rock on!